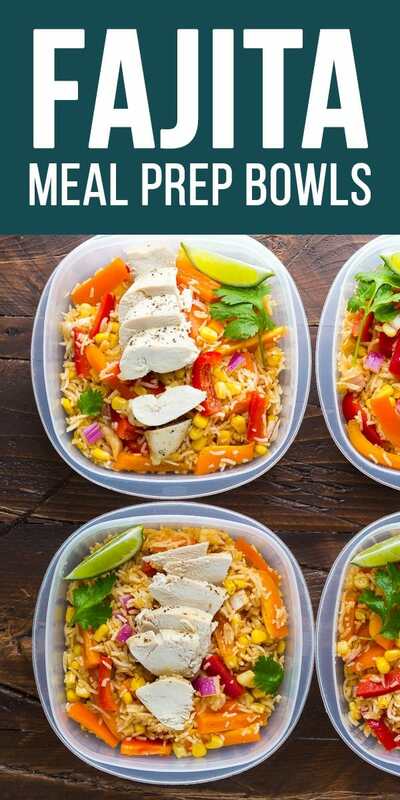 Make these meal prep chicken fajita lunch bowls and have your work lunches ready for a full week! 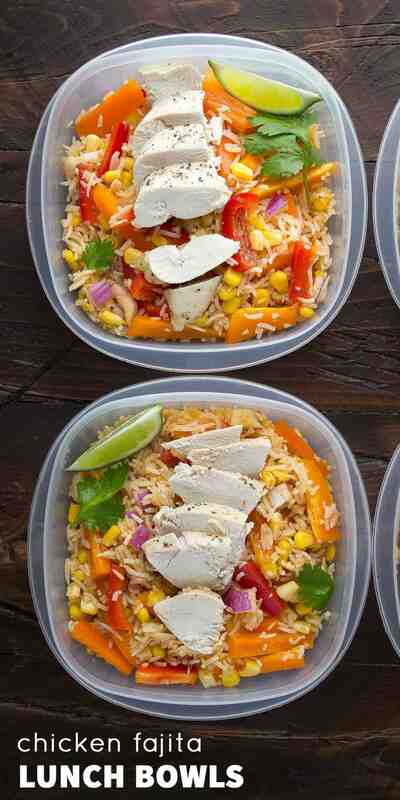 Packed with healthy vegetables and topped with baked chicken breast. How are you doing? How was your week-end? I’m going to be completely honest here: our week-end was FABULOUS. It’s not that anything particularly exciting happened, just that we pretty much spent the entire week-end outside! Kai played in his new sandbox, I lounged on my deck chair, and Ben got the BBQ fired up. FAB-U-LOUS. I got more vitamin D and fresh air than I’ve had since last summer, and I feel so revitalized, and pumped up for more warm weather to come! 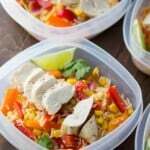 Fresh air and sunshine aside, I am also pretty pumped about these chicken fajita lunch bowls! You guys know I am a huge fan of lunch bowls. Evidence: this round-up, these Cauliflower Cashew Lunch Bowls, and these Peanut-Lime Chicken Lunch Bowls. If you’re like me in the morning (borderline useless), you just want to grab something and run out the door. There is just something so nice about having your fridge stocked with lunches for the work week. This recipe combines basmati rice (feel free to sub your favorite rice) with lots of fresh bell peppers and corn kernels. It is topped with baked chicken breast and tossed in a vinaigrette that is full of fajita flavor: chili powder, paprika and cumin. And lime juice! Happy Monday! I’ll be back on Thursday, which is 30 Minute Thursday for April! Made this for dinner tonight & it was delicious! I sauteed the onion, red pepper & corn in a little olive oil & served it hot w/a little Mexican cheese & sour cream. Also served the vinaigrette on the side cuz I’m not a huge fan of vinegar. Yum! Eager to try these but whats with the sugar in the vinaigrette? Ugh can I make it without sugar? It just seems totally unnecessary when you’re trying to eat healthy and also a tablespoon of sugar seems like a lot! This recipe looks so delicious! I was just wondering if this freezes well? Hai may I ask how many days can I keep this meal for? Hi Jasmine! Up to 4 days! Hello, I never ate rice cold. Are you supposed to warm this up? I really like this recipe but I am curious to try it warmed up. How long do you warm it for? It would be good for wintery nights! Love this recipe – soooo easy and quick. 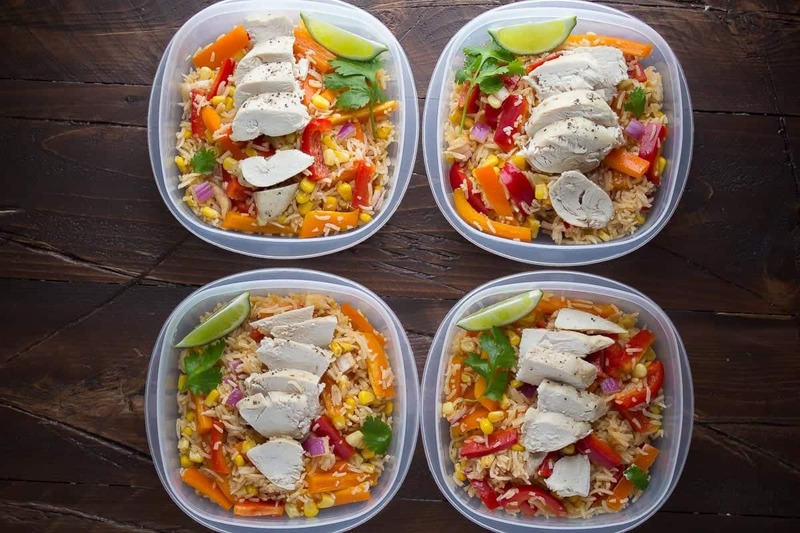 There’s nothing worse than spending your whole sunday meal prepping for the coming week. The vinegarette makes it – although personally i’ve found 1tsp of cumin is too much. I’d suggest 1/2tsp. Or may try without. I’m trying to figure out how that recipe divided into four servings is 479 calories per serving? I wanted you to know that I made this yesterday, just like the recipe. I didn’t have yellow pepper so I only used a red one. I added a few slices of avocado and Fajita chicken that is already cooked. I had one portion for lunch toady and it was absolutely delicious. Really easy to make and perfect for the lunch week. I will be making this again for sure. This is one of the best meals I’ve ever had. My husband said it was in the top 3 (he always rating them so I know what to make again haha). Thanks! Awesome, I’m so glad your family enjoyed it, Betti 🙂 Thanks so much for your comment. Hi – thanks for this – it’s a great idea for school lunches. My kids will love the different idea! I’m so glad, I hope they like them Bec! Any idea on 21 day fix container count? Hi Lana, sorry I don’t follow. I don’t know how 21 day fix works? how can you cut the calorie and fat in this. Is it the rice or the chicken that makes it so high? I am student intern wellness coordinator at People Corporation. I came across your recipe on your blog. I would love to use this recipe for this month’s wellness email we send out to our internal staff. I was wondering if you can grant me permission on using this recipe in our upcoming month’s recipe of the month email. It would be greatly appreciated. This seemed like a popular question that I didn’t think about until after I made it – Do you eat it hot or cold? I read the comments and it seemed everyone ate it cold, but I didn’t think I would like the cold rice or chicken. I decided to give it a try and heat it up and it was delicious!! This is amazing! I made it Sunday and gave 2 to my daughter and saved 2 for me. She heated hers up and I ate mine cold, we both just figured that’s the way it was supposed to be eaten and both loved it. I marinated the chicken in a Mojo marinade by Badia which gave it a bit of a citrusy flavor and I chopped up fresh cilantro in the rice. This recipe is a keeper and I can’t wait to try others! Thank you! Thanks for sharing this colorful lunch bowl idea. I am wondered it could be considered as a cold rice salad. Wouldn’t the rice turn hardened if you take out from refrigerator to enjoy it without using microwave to heat it? I think it might be the food cultural difference. I am Chinese and live in China, we prefer warm rice most of the time. And you keep the bell pepper and onions raw right? I would like to cook them a bit. Anyway, it looks yummy and a great match. Thanks for your sharing. Hi Melody! Yes, this is a cold rice salad, inspired by a Mexican bean salad. I eat the salad cold myself, but my husband likes his warmed up. I think the onions & peppers would be great roasted in some olive oil at 425°F for 15-25 minutes. Hope you like it! Thanks for your instant feedback Denise, I will try your recipe, I thought at the beginning you may have some method to keep the rice soften after storage in refrigerator. I may try the “warm version” and share with you. Oh I forgot to mention that part, because it is dressed (in the vinaigrette), the rice does not stick together. Thanks, I already follow your page on FB. Hiiii,what can we use instead of white wine vinegar? Hi Shik! You can use almost any vinegar, red wine, apple cider etc. I’m sure they’ll all be good. Made this for dinner tonight and it was incredibly flavourful and really delicious! We’re vegetarian so I subbed the chicken with black beans. They went really well with the other ingredients in the salad. I did warm mine a bit and added a scoop of homemade mango salsa. Soo good! Thanks for a keeper! I’m sorry if I missed this somewhere in the comments, but I was wondering if the nutritional info is for each serving or if it is for the entire recipe? Hi Brittany, so sorry for my late reply. The nutritional info is for one serving. What kind of containers do you use? Ours are getting a bit raggedy and before buying new ones, I’d like to know other people are using. Otherwise, I’m excited about checking this recipe out! Hi Daniel! The ones in the photos are these Rubbermaid ones: http://amzn.to/2a1T04B, but I just picked up some glass storage containers and am excited to use them: http://amzn.to/29F3Jkc They are freezer, oven and microwave safe, so that’s awesome! Thank you Denise! I’ll look at those. Do you think I could make these and freeze them for meal prep? Hi Jenny! I’m not really sure about freezing them. It’s like a salad, so it’s better if the veggies haven’t been freeze/thawed. I’m not sure the rice + vinaigrette would freeze/thaw well either. But please let me know if you try it! Hi Momzie, I have not. I am not a fan of rice that has been freeze/thawed, but if you try it, let me know! Have you tried cooking the peppers and onions when you bake the chicken, like normal fajitas? Hi Kim, I haven’t tried that, but you could probably throw them in the oven for the last 10 minutes of baking? Not sure if they will last as long as the raw peppers though? Just finished making this recipe for my lunches next week. Actually looking forward to my lunch hour for more than just a break from work. Thanks! Hi Nicole! I hope you like them! It’s nice to have something to look forward to at lunch! Hi Anna, we ate the whole thing cold (chicken included). I’m so glad you liked it! I love this idea, Denise, and am seriously thinking of making this salad for next week’s work lunches. I often struggle to eat healthily at work, but this is perfect. These are so pretty! I love all the colors. They’re definitely way better and way more delicious than any take-out lunch too. I’m always looking for new ideas to send to work with hubby so I’ll have to try these! Thanks, Jess! I find take-out lunches are so hit and miss and even the ‘healthy’ ones are kind of meh. I hope you like them if you guys try them! What a great idea for weekday lunches! We need to make these soon! Aaw yay! What a perfect weekend! I am SO ready for spring and warmer weather – we got SNOW but I am hoping it’s the last we see of it. 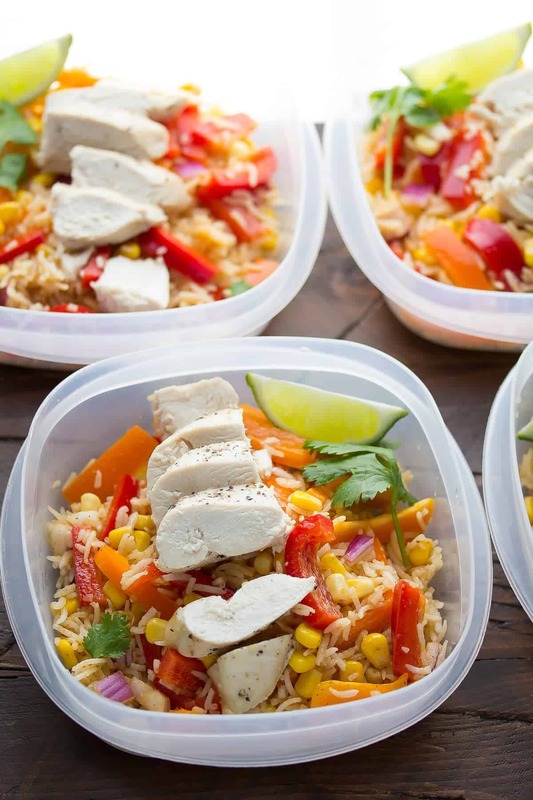 These make-ahead lunch bowls look so fresh and delicious! Love the pretty colors! I love all of your make ahead recipes, Denise! We eat fajitas all of the time in our house, so I think Josh would love these too. I really may have to give these a try for next week! Thank you, thank you for this! I really need to get my act together on the weekends for meal prep, and you’ve inspired me to do it. This recipe is perfect. Pinning! I was in Arizona this weekend and it was so nice and warm…and now it’s back to reality in cold Chicago! 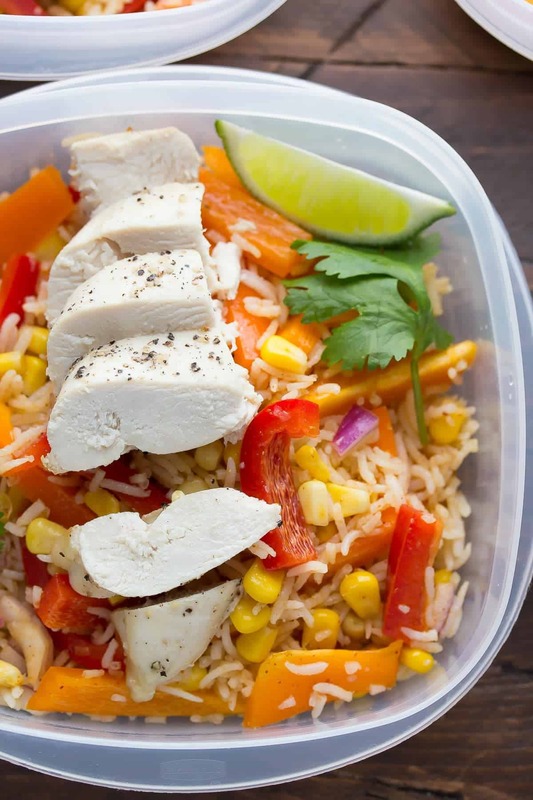 Oh well…these lunch bowls look SO good, Denise! I love the fajita flavor! It was such a nice weekend here too! I adore this sunny weather – summer feels so so close. 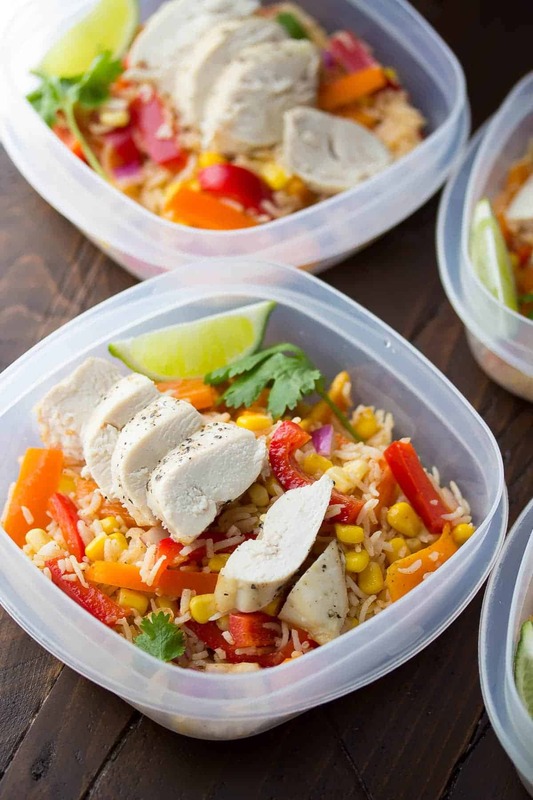 These chicken fajitas bowls are definitely a perfect make-ahead lunch and they look absolutely delicious! Glad you had a nice weekend, Denise! I for one was stuck inside most of it for a basketball tournament, but here’s to hoping that changes this week! These lunch bowls look perfect for me because I’m all about Mexican food — yum! We spent the weekend at the Farm and it was wonderful! It was cold but we all just sort of laid out in the sun all weekend! I’m ready for warm weather to be here for good! And these bowls! I just love these bowls! I love this time of year, so much to look forward to! Thanks, Annie! Well this is pretty much a salad, but it still tastes really good 🙂 Thanks, Sarah! YES! Winter felt long this year even though it was a warmer weather. Thanks, April! Hi Sheri! Yep, cold. It’s kind of like a rice salad! Would it be good heated up?